8:5 When he entered Capernaum, 9 a centurion 10 came to him asking for help: 11 8:6 “Lord, 12 my servant 13 is lying at home paralyzed, in terrible anguish.” 8:7 Jesus 14 said to him, “I will come and heal him.” 8:8 But the centurion replied, 15 “Lord, I am not worthy to have you come under my roof. Instead, just say the word and my servant will be healed. 8:9 For I too am a man under authority, with soldiers under me. 16 I say to this one, ‘Go’ and he goes, 17 and to another ‘Come’ and he comes, and to my slave 18 ‘Do this’ and he does it.” 19 8:10 When 20 Jesus heard this he was amazed and said to those who followed him, “I tell you the truth, 21 I have not found such faith in anyone in Israel! 8:11 I tell you, many will come from the east and west to share the banquet 22 with Abraham, Isaac, and Jacob 23 in the kingdom of heaven, 8:12 but the sons of the kingdom will be thrown out into the outer darkness, where there will be weeping and gnashing of teeth.” 24 8:13 Then Jesus said to the centurion, “Go; just as you believed, it will be done for you.” And the servant 25 was healed at that hour. 8:28 When he came to the other side, to the region of the Gadarenes, 50 two demon-possessed men coming from the tombs met him. They were extremely violent, so that no one was able to pass by that way. 8:29 They 51 cried out, “Son of God, leave us alone! 52 Have you come here to torment us before the time?” 53 8:30 A 54 large herd of pigs was feeding some distance from them. 8:31 Then the demons begged him, 55 “If you drive us out, send us into the herd of pigs.” 8:32 And he said, 56 “Go!” So 57 they came out and went into the pigs, and the herd rushed down the steep slope into the lake and drowned in the water. 8:33 The 58 herdsmen ran off, went into the town, 59 and told everything that had happened to the demon-possessed men. 8:34 Then 60 the entire town 61 came out to meet Jesus. And when they saw him, they begged him to leave their region. 1 tn Grk “And behold, a leper came.” The Greek word ἰδού (idou) has not been translated because it has no exact English equivalent here, but adds interest and emphasis (BDAG 468 s.v. 1). sn The ancient term for leprosy covers a wider array of conditions than what we call leprosy today. A leper was totally ostracized from society until he was declared cured (Lev 13:45-46). 3 tn This is a third class condition. The report portrays the leper making no presumptions about whether Jesus will heal him or not. 4 sn Touched. This touch would have rendered Jesus ceremonially unclean (Lev 14:46; also Mishnah, m. Nega’im 3.1; 11.1; 12.1; 13.6-12). 5 sn The command for silence was probably meant to last only until the cleansing took place with the priests and sought to prevent Jesus’ healings from becoming the central focus of the people’s reaction to him. See also 9:30, 12:16, 16:20, and 17:9 for other cases where Jesus asks for silence concerning him and his ministry. 7 sn On the phrase bring the offering that Moses commanded see Lev 14:1-32. 8 tn Or “as an indictment against them.” The pronoun αὐτοῖς (autoi") may be a dative of disadvantage. 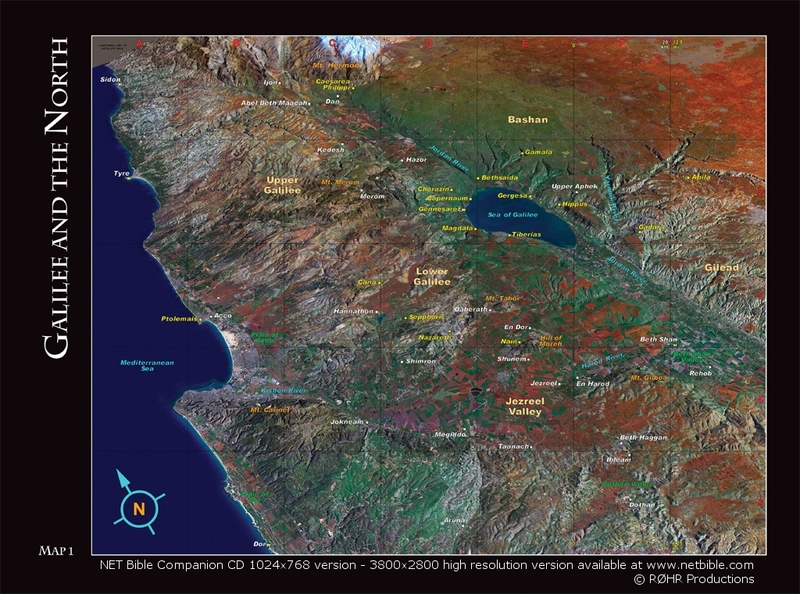 9 sn Capernaum was a town on the northwest shore of the Sea of Galilee, 680 ft (204 m) below sea level. It was a major trade and economic center in the North Galilean region. map For location see Map1-D2; Map2-C3; Map3-B2. 10 sn A centurion was a noncommissioned officer in the Roman army or one of the auxiliary territorial armies, commanding a centuria of (nominally) 100 men. The responsibilities of centurions were broadly similar to modern junior officers, but there was a wide gap in social status between them and officers, and relatively few were promoted beyond the rank of senior centurion. The Roman troops stationed in Judea were auxiliaries, who would normally be rewarded with Roman citizenship after 25 years of service. Some of the centurions may have served originally in the Roman legions (regular army) and thus gained their citizenship at enlistment. Others may have inherited it, like the apostle Paul did. 11 sn While in Matthew’s account the centurion came to him asking for help, Luke’s account (7:1-10) mentions that the centurion sent some Jewish elders as emissaries on his behalf. 12 tn Grk “and saying, ‘Lord.’” The participle λέγων (legwn) at the beginning of v. 6 is redundant in English and has not been translated. 13 tn The Greek term here is παῖς (pais), often used of a slave who was regarded with some degree of affection, possibly a personal servant (Luke 7:7 uses the more common term δοῦλος, doulos). See L&N 87.77. 14 tn Grk “And he”; the referent (Jesus) has been specified in the translation for clarity. 15 tn Grk “But answering, the centurion replied.” The participle ἀποκριθείς (apokriqeis) is redundant and has not been translated. 17 sn I say to this one ‘Go’ and he goes. The illustrations highlight the view of authority the soldier sees in the word of one who has authority. Since the centurion was a commander of a hundred soldiers, he understood what it was both to command others and to be obeyed. 18 tn Though δοῦλος (doulos) is normally translated “servant,” the word does not bear the connotation of a free individual serving another. BDAG notes that “‘servant’ for ‘slave’ is largely confined to Biblical transl. and early American times… in normal usage at the present time the two words are carefully distinguished” (BDAG 260 s.v. 1). The most accurate translation is “bondservant” (sometimes found in the ASV for δοῦλος) in that it often indicates one who sells himself into slavery to another. But as this is archaic, few today understand its force. 19 tn The word “it” is not in the Greek text, but is implied. Direct objects were frequently omitted in Greek when clear from the context. 20 tn Here δέ (de) has not been translated. 22 tn Grk “and recline at table,” as 1st century middle eastern meals were not eaten while sitting at a table, but while reclining on one’s side on the floor with the head closest to the low table and the feet farthest away. The word “banquet” has been supplied to clarify for the modern reader the festive nature of the imagery. The banquet imagery is a way to describe the fellowship and celebration of being among the people of God at the end. 23 tn Grk “and Isaac and Jacob,” but καί (kai) has not been translated since English normally uses a coordinating conjunction only between the last two elements in a series of three or more. 24 sn Weeping and gnashing of teeth is a figure for remorse and trauma, which occurs here because of exclusion from God’s promise. 25 tc ‡ Most mss read αὐτοῦ (autou, “his”) after “servant.” It is unlikely that the pronoun was accidentally overlooked by such diverse witnesses as א B 0250 0281 Ë1 33 latt. More likely is the probability that Western, Byzantine, and some other scribes added the word for clarification (so C L W Θ 0233 Ë13 Ï sy sa). NA27 has the pronoun in brackets, indicating doubts as to its authenticity. 26 tn Grk “And.” Here καί (kai) has been translated as “now” to indicate the transition to a new topic. 27 tn Grk “having been thrown down.” The verb βεβλημένην (beblhmenhn) is a perfect passive participle of the verb βάλλω (ballw, “to throw”). This indicates the severity of her sickness. 29 sn Note how the author distinguishes healing from exorcism here, implying that the two are not identical. 30 tn Grk “was fulfilled, saying.” The participle λέγοντος (legontos) is redundant and has not been translated. 31 sn A quotation from Isa 53:4. 33 tn The phrase “of the lake” is not in the Greek text but is clearly implied; it has been supplied here for clarity. 35 tn Or “a scribe.” See the note on the phrase “experts in the law” in 2:4. 36 sn The statement I will follow you wherever you go is an offer to follow Jesus as a disciple, no matter what the cost. 37 tn Grk “the birds of the sky” or “the birds of the heaven”; the Greek word οὐρανός (ouranos) may be translated either “sky” or “heaven,” depending on the context. The idiomatic expression “birds of the sky” refers to wild birds as opposed to domesticated fowl (cf. BDAG 809 s.v. πετεινόν). 38 sn Jesus’ reply is simply this: Does the man understand the rejection he will be facing? Jesus has no home in the world (the Son of Man has no place to lay his head). 39 tn Here δέ (de) has not been translated. 40 tc ‡ Most mss (C L W Θ 0250 Ë1,13 Ï lat sy mae bo) read αὐτοῦ (autou, “his”) here, but the earliest witnesses, א and B (along with 33 and a few others), lack it. The addition may have been a motivated reading to clarify whose disciples were in view. NA27 includes the pronoun in brackets, indicating doubt as to its authenticity. 41 sn There are several options for the meaning of Jesus’ reply Leave the dead to bury their own dead: (1) Recent research suggests that burial customs in the vicinity of Jerusalem from about 20 b.c. to a.d. 70 involved a reinterment of the bones a year after the initial burial, once the flesh had rotted away. At that point the son would have placed his father’s bones in a special box known as an ossuary to be set into the wall of the tomb. Thus Jesus could well be rebuking the man for wanting to wait around for as much as a year before making a commitment to follow him. In 1st century Jewish culture, to have followed Jesus rather than burying one’s father would have seriously dishonored one’s father (cf. Tobit 4:3-4). (2) The remark is an idiom (possibly a proverbial saying) that means, “The matter in question is not the real issue,” in which case Jesus was making a wordplay on the wording of the man’s (literal) request (see L&N 33.137). (3) This remark could be a figurative reference to various kinds of people, meaning, “Let the spiritually dead bury the dead.” (4) It could also be literal and designed to shock the hearer by the surprise of the contrast. Whichever option is preferred, it is clear that the most important priority is to follow Jesus. 42 sn A boat that held all the disciples would be of significant size. 43 tn The participle προσελθόντες (proselqonte") has been translated as a finite verb due to requirements of contemporary English style. 44 tn Grk “And.” Here καί (kai) has been translated as “but” to indicate the contrast present in this context. 45 tn Or “commanded” (often with the implication of a threat, L&N 33.331). 46 sn Who has authority over the seas and winds is discussed in the OT: Ps 104:3; 135:7; 107:23-30. When Jesus rebuked the winds and the sea he was making a statement about who he was. 47 tn It is difficult to know whether ἄνθρωποι (anqrwpoi) should be translated as “men” or “people” (in a generic sense) here. At issue is whether (1) only the Twelve were with Jesus in the boat, as opposed to other disciples (cf. v. 23), and (2) whether any of those other disciples would have been women. The issue is complicated further by the parallel in Mark (4:35-41), where the author writes (4:36) that other boats accompanied them on this journey. 48 tn Grk “the men were amazed, saying.” The participle λέγοντες (legontes) has been translated as a finite verb to make the sequence of events clear in English. 49 sn Jesus’ authority over creation raised a question for the disciples about his identity (What sort of person is this?). This verse shows that the disciples followed Jesus even though they did not know all about him yet. 50 tc The textual tradition here is quite complicated. A number of mss (B C [Δ] Θ al sys,p,h) read “Gadarenes,” which is the better reading here. Many other mss (א2 L W Ë1,13 Ï [syhmg] bo) have “Gergesenes.” Others (892c latt syhmg sa mae) have “Gerasenes,” which is the reading followed in Luke 8:26. The difference between Matthew and Luke may be due to uses of variant regional terms. 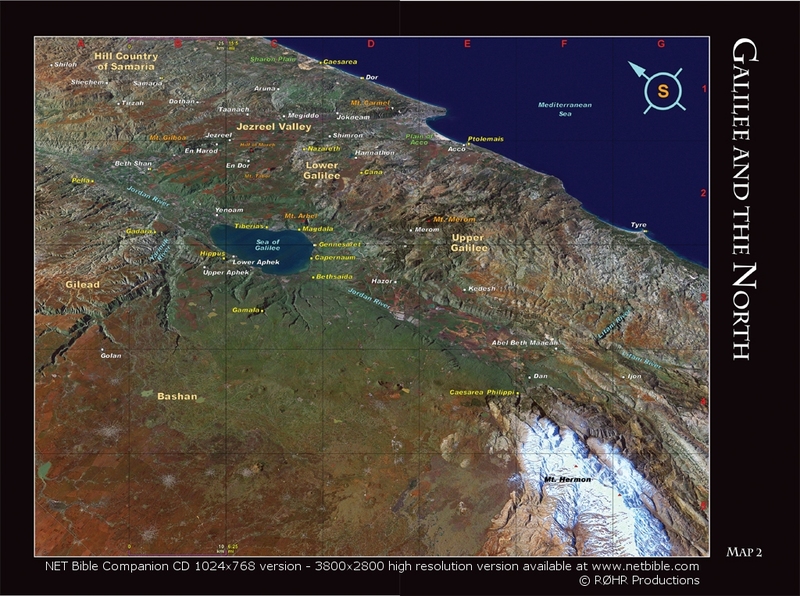 sn The region of the Gadarenes would be in Gentile territory on the southeastern side of the Sea of Galilee across from Galilee. Luke 8:26 and Mark 5:1 record this miracle as occurring “in the region of the Gerasenes.” “Irrespective of how one settles this issue, for the [second and] Third Evangelist the chief concern is that Jesus has crossed over into Gentile territory, ‘opposite Galilee’” (J. B. Green, Luke [NICNT], 337). 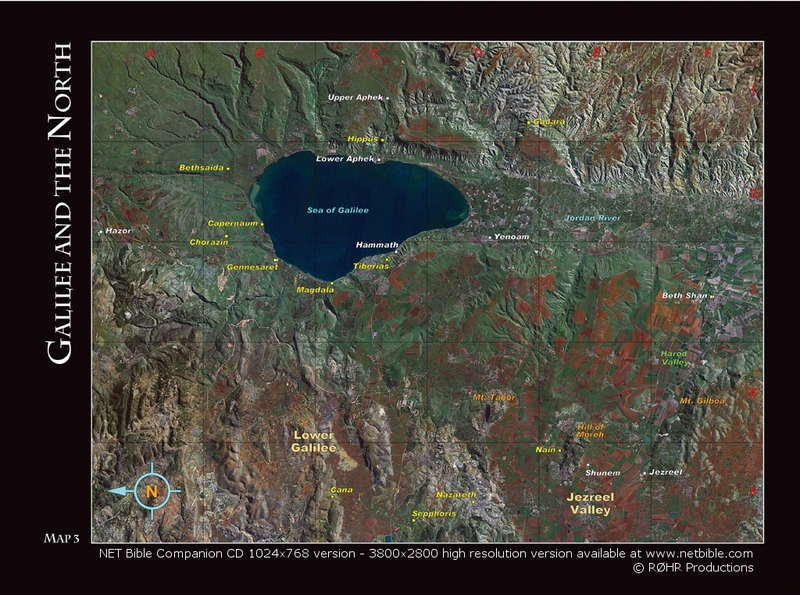 The region of Gadara extended to the Sea of Galilee and included the town of Sennabris on the southern shore – the town that the herdsmen most likely entered after the drowning of the pigs. 51 tn Grk “And behold, they cried out, saying.” The Greek word ἰδού (idou) has not been translated because it has no exact English equivalent here, but adds interest and emphasis (BDAG 468 s.v. 1). The participle λέγοντες (legontes) is redundant and has not been translated. 53 sn There was an appointed time in which demons would face their judgment, and they seem to have viewed Jesus’ arrival on the scene as an illegitimate change in God’s plan regarding the time when their sentence would be executed. 54 tn Here δέ (de) has not been translated. 55 tn Grk “asked him, saying.” The participle λέγοντες (legontes) is redundant in contemporary English and has not been translated. 57 tn Here δέ (de) has been translated as “so” to indicate a conclusion and transition in the narrative. 58 tn Here δέ (de) has not been translated. 59 tn Or “city.” But see the sn on “Gadarenes” in 8:28. 60 tn Here καί (kai) has been translated as “then” to indicate the implied sequence of events within the narrative. The Greek word ἰδού (idou) has not been translated because it has no exact English equivalent here, but adds interest and emphasis (BDAG 468 s.v. 1).